Probably the very best Elvis book for true Elvis fans. Written by the Norwegian Stein Erik Skar. Containing concert information from 1969 to 1977 with several newspaper-reviews, a list of songs performed on the different tours and Las Vegas seasons. A detailed list of venues and stage outfit used by Elvis. And... of course several pictures, in color! You will find this on 270 pages, all written in English. Elvis in print is big business with a staggering number of titles, and subject matter ranging from the serious to the ridiculous. 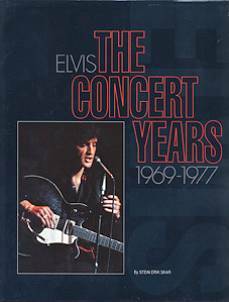 Yet with so many titles, only a few address the concert era, and only "Elvis: The Concert Years" is comprehensive in scope. For the concert era fan, it is the ultimate book. Stein Erik Skar is our guide from Las Vegas on July 31st 1969 through Indianapolis on June 26th 1977. His background spin on each tour, season, and event, gives us a look into the quality of the shows, and what was influencing Elvis’ performances. The press coverage rounds out the story and provides some alternate (and sometimes unflattering) views of our man. Sections that catalog the musicians, songs (including one liner's), costumes, tours, etcetera, make this a great source of reference. It’s a “coffee table” book, but don’t get the idea that it’s the Gutenberg Bible. For such an exhaustive source of information the book is streamline and lightweight. The pictures are incredible! Most of them are color concert photos. The pictures are from 1969 through 1977, and they’re entered chronologically throughout the book. No pictures from the 50’s or the movie era (thank goodness). The most impressive aspect of this book is the author himself. He is both an Elvis fan, and a true journalist. He doesn’t skirt around Elvis’ darker side nor is he syrupy about Elvis. In professional journalistic fashion, the information is presented without excuse or pretense. And it is clear that Skar did a lot of research. Plus, he is an excellent writer. In the epilogue, for example, he uses the Coroner’s official report to undo the many myths surrounding Elvis’ death. Its fascinating reading, and worth the purchase price of the book. As an American born and raised, I’m pleased with how some fans from outside the U.S. treat our brightest star. And this book stands out as a shining example of honor and respect for Elvis; the type of respect he often doesn’t get from those in charge of his legacy. An article by Jon Landau is reprinted in the book. A quote from that article reads, “[Elvis] remains an artist; in fact, an American artist and one whom we should be proud to claim as our own” (pg.46). I couldn’t disagree more. In this fantastic document, Skar shows us that Elvis, the greatest concert performer that ever lived, is an artist that belongs to the world.